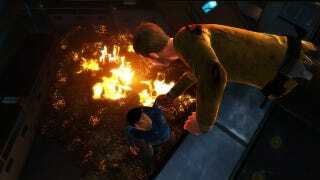 This time last year, Star Trek, the upcoming game from Digital Extremes, had licensed the appearances of Chris Pine and Zachary Quinto, who had portrayed Kirk and Spock in the 2009 cinematic reboot. The actors' voice work had yet to be signed. Well, yesterday, the two beamed aboard. Not only that, they'll be joined by every other principal crew member who starred in the movie. For the record, that's Zoe Saldana as Uhura, Simon Pegg as Scotty, Karl Urban as Bones, John Cho as Sulu and Anton Yelchin as Chekov. That's called getting the crew back together. The game employs drop-in co-op gaming as Kirk and Spock team up against desperate odds and another alien threat. An official website launched today, with that screenshot above and several other images. The game is due in early 2013.